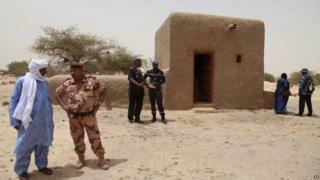 Fourteen mausoleums in the city of Timbuktu in northern Mali have been rebuilt, three years after they were destroyed by Islamist extremists. The reconstruction was carried out by local stonemasons working for the UN's cultural organisation, Unesco. On a visit to the city, Unesco's chief said she wanted those responsible for the destruction to be brought before the International Criminal Court. The entire city of Timbuktu is listed as a World Heritage Site by Unesco. The city was considered the centre of Islamic learning from the 13th to the 17th Centuries. At one time it counted nearly 200 schools and universities that attracted thousands of students from across the Muslim world. The mausoleums were shrines to Timbuktu's founding fathers, who had been venerated as saints by most of the city's inhabitants. But this practice is considered blasphemous by fundamentalists who occupied the city along with much of northern Mali in 2012, until they were forced out by French forces in January 2013. During their occupation, the militants vandalised and destroyed mosques and mausoleums, and burnt tens of thousands of ancient manuscripts. Unesco's Irina Bokova, inaugurating the rebuilt mausoleums on Saturday, said the destruction of cultural heritage is considered a war crime under the UN's 1954 Hague Convention. "Unesco has involved the International Criminal Court with the destruction of the mausoleums," she said. "Two months ago I met the prosecutor and I believe they are progressing rapidly, and I hope they will be ready to present the case to the ICC." Local stone masons used traditional building methods and cultural knowledge of the area in the year-long rebuilding of the mausoleums. Paying tribute to them, Ms Bokova said: "Your work is a lesson in tolerance, dialogue and peace... it is an answer to all extremists whose echo can be heard well beyond the borders of Mali."